In the Rahul Gandhi-Arun Jaitley debate, the core issues that should concern voters have been obfuscated. 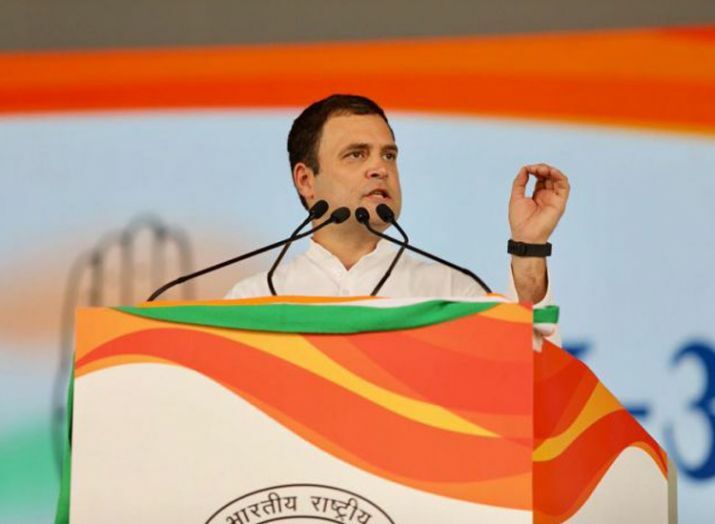 New Delhi: In a note posted on Facebook on Wednesday, senior BJP leader Arun Jaitley accused Rahul Gandhi of being ‘liberal’ with the facts in the speech that the Congress president delivered in Mandsaur, Madhya Pradesh. In a point-by-point rebuttal, Jaitley offered counter facts. But to what extent do the counter-arguments hold up? The Wire breaks it down and examines how in this debate, the core issues that should concern voters have been obfuscated. 1) Rahul Gandhi accused the Centre of waiving off Rs 1.5 lakh crore worth of loans of 15 industrialists. Technically, Jaitley is right in saying that the government has not ‘waived off’ loans of any industrialist. However, the Narendra Modi government told parliament in April this year that between April 2014 and December 2017, public sector banks (PSBs) wrote off Rs 2,72,558 crore worth of loans. 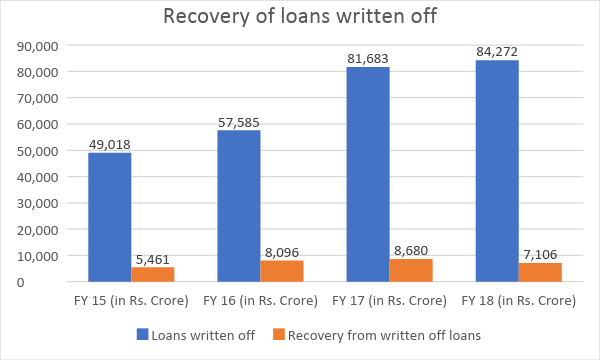 While a write-off is not the same as a loan waiver, as the loan still remains receivable, the rate of recovery of loans that have been written off is not something that the former finance minister would be too proud of. Public sector banks recovered Rs 29,343 crore – a mere 10.7% – of the loans that had been written off in the three-year period. Source: Government’s reply in parliament. Jaitley also pointed to the efforts of ‘Prime Minister Modi’s government’ in recovering money through the Insolvency and Bankruptcy Code (IBC). However, according to recent reports in The Business Standard, the performance of the IBC has been far from satisfactory. Of the cases that were admitted under the IBC, only 1.9% were resolved till December 2017. The reports also show that in 37 big cases where a principal amount of Rs 4 trillion is owed, banks are estimated to recover only Rs 1.7 trillion. This makes the recovery rate of bad loans in these cases a mere 43%, a figure Jaitley would want to better. And the figure itself could be an overestimate as it deals only with the principal amount and does not take into account the other unpaid dues and charges. A sector analysis also showed that the rate of recovery of loans could slow down even further. Jaitley does not respond to the main thrust of the argument made by Rahul Gandhi. However, on Gandhi’s point that banks have a propensity to avoid lending to farmers, there is data to point that the share of credit extended to the agriculture sector remains low. According to a report in Mint, in 2016-17, agriculture accounted for 13.91% of the total outstanding credit, while industries accounted for 37.3%. Industries and services put together accounted for 63.34%. Further, according to a report in The Hindu, credit to the agriculture sector saw a contraction in growth. Agri credit grew only at 3.8% for the year ended March 2018, as compared to 12.4% for the year ended March 2017. RBI data has also shown that the farm sector performs better when it comes to repayment of loans as compared to the industries sector. In fiscal 2017, the agriculture sector defaulted on 6% of its total credit, while the industry sector defaulted on 20%. 3) In his speech, Rahul Gandhi reportedly said that the prime Minister has given Rs.35000 crores each to two diamond jewellers who have now escaped out of country. Jaitley responded by stating that Gandhi’s claims were “factually false” and that the “banking fraud started in the year 2011 when the UPA II was in power. It was only detected during the NDA period”. Rahul is in the wrong here. Stating that the prime minister himself gave Rs 35,000 crore to diamond merchants Nirav Modi and Mehul Choksi is obviously false and hyperbolic. The larger point that both politicians are looking to avoid is that both the UPA and NDA governments must share blame for the Nirav Modi scam. As Jaitley notes, it’s true that the letter of undertaking (LoU) fraud started in 2011. What he leaves out is that the size of the fraud, the bulk of it actually, deeply accelerated in 2017. On potentially preventing the Rs 13,000 crore fraud, as The Wire has extensively reported and analysed, both the UPA and NDA-II governments are at fault. As M.K. Venu has noted, the years 2013 and 2017 are key to understanding how the Punjab National Bank scam played out. The Modi government has also been left looking a little more red-faced as the scam wasn’t detected in time to prevent Nirav Modi and Mehul Choksi from leaving the country. To add salt to the injury, whistleblower complaints to the PMO and Jaitley’s own ministry were ignored. Nirav Modi was also part of the India CEO meet organised by the Modi government in Davos, one week before the scam broke. 4) What Rahul said: “If the Congress comes to power mobile phones, which are made in China, will now be manufactured in India”. 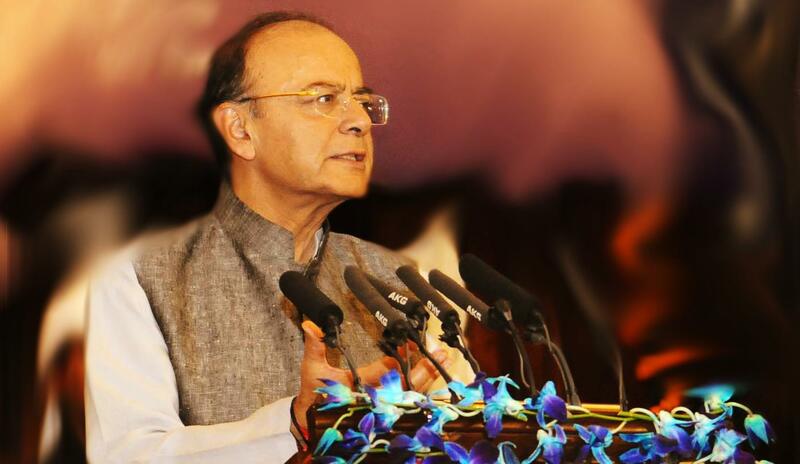 What Jaitley said: A case of inadequate knowledge. In the year 2014 when UPA went out of power, there were only two mobile phone manufacturing units in India. In 2018, with the result of our electronics policy and the incentives in a four year period, this has increased to 120 units with an investment of Rs.1,32,000 crores. Jaitley misses the larger point and gets one of his facts wrong. While the number of mobile phone plants set up in India has indeed increased sharply (from less than five in 2014 to over 100 in 2018), most of these ‘manufacturing units’ are largely assembly centres, where workers put together sophisticated components that are imported from China and other South-East Asian countries. A 2016 study by IIM-Bangalore and Counterpoint Research found that the current contribution of locally sourced (or Made in India) components and sub-components accounted for just 6% of total value of components that go into a phone, a fact that the study calls “economically unfortunate”. For instance, in 2015, the total value of mobile phones sold in India was around $11.5 billion. Out of that, the “true local value addition generated in local component sourcing and local assembly will be close to $650 million”, according to the IIM-Counterpoint study. This ‘manufacturing versus assembly’ debate ties into Jaitley’s second point, which is that 120 units have been set up with an investment of “Rs 1,32,000 crores”. This investment statistic is false. The Rs 1.32 lakh crore figure that the former finance minister refers to can be traced back to a statement made by IT minister Ravi Shankar Prasad in April 2018. At the time, the IT minister noted that India’s mobile manufacturing industry would touch Rs 1,32,000 crore by the end of 2018, up from over Rs 90,000 crore at the end of 2017. The figure that Prasad is referring to here is the total value of mobile phones produced (read: assembled) in India and not the quantum of investment that went into setting up those plants. Mobile phone units that engage primarily in assembly and not manufacturing require less investment. While we don’t know the current level of investment that has gone into setting up the over 100 new units, an estimate from 2016 noted that the 50 new mobile manufacturing facilities that had been set up from 2014 were brought up with a “combined capex of close to Rs 1,700 crore or $267 million”. Even assuming a higher-end projection, it seems unlikely that the remaining 70 units were set up with more than Rs 10,000 crore in investment. Jaitley’s Rs 1.32 lakh crore figure, therefore, is more likely the the total value of mobile phones that are assembled at these 120 plants. What Jaitley said: The latest GDP data has re-emphasised India as the fastest growing economy in the world.There is a double digit growth in construction, expansion in manufacturing, an increased capital formation which indicates investment increase, large investment in physical infrastructure and increased investment in rural India. All these are job creating sectors. The senior BJP leader obfuscates the subject again. Yes, it’s true that India’s GDP growth is on the rise again – although Jaitley ignores the debate over deflators and the fact that demonetisation and GST was what slowed growth down considerably in 2016 and 2017. It is also true this rise has been led by a spurt in the manufacturing and construction sectors. The second part is where his argument is weak – that this GDP growth has automatically resulted in abundant high-quality jobs. The phenomenon of jobless growth has been a hotly debated subject over the last two years. For instance, we know that anywhere between 10 to 12 million graduates hit the job market in India every year. But, as The Wire has reported and documented, nobody seems to agree on how many jobs are being created. Consider a recent debate. The Centre for Monitoring Indian Economy (CMIE), a well-respected think-tank, insists that India added just 1.43 million jobs in 2017. The think-tank was countering claims put forth by senior economist Surjit Bhalla, also a member of the Prime Minister’s Economic Advisory Council, who reckons that it could be over 15 million. The government’s own think-tank, the NITI Aayog, appears to have taken a middle path with claims of seven million jobs being created in 2017. Much of this debate centres around vital, if arcane, quibbling over methodological issues and how well India’s policy-makers are able to capture job creation in the informal sector. On one thing most people appear to agree is that even if India is creating an adequate number of jobs, they are likely poor-quality jobs, giving rise to the certainty that under-employment certain afflicts vast swathes of the country. This debate will also be hopefully more informed later this year when the labour ministry’s attempts at counting jobs created in the informal economy (at establishments who deploy less than 10 people) start bearing fruit. Until then, Jaitley’s claims of adequate job creation, vis-à-vis higher GDP growth, need to be taken with a pinch of salt.